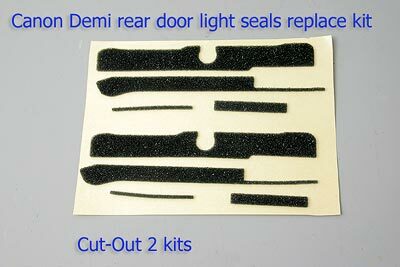 This is Canon Demi's Light Seals foam (backdoor gasket sponge) replace kit. This seal kit covers green halftone portions as below. It seals the light from outside perfectly. Light seals foam is self adhesive and cut as rear door ditch's shape. 2 foam kits are included, you do not have to worry if you waste one. If you are not so confident, you can use 1 kit for exercise, you can install perfectly for the 2nd time. This kit fit to DEMI (first version? ), does NOT fit to Demi S, E, EE17, EE28.